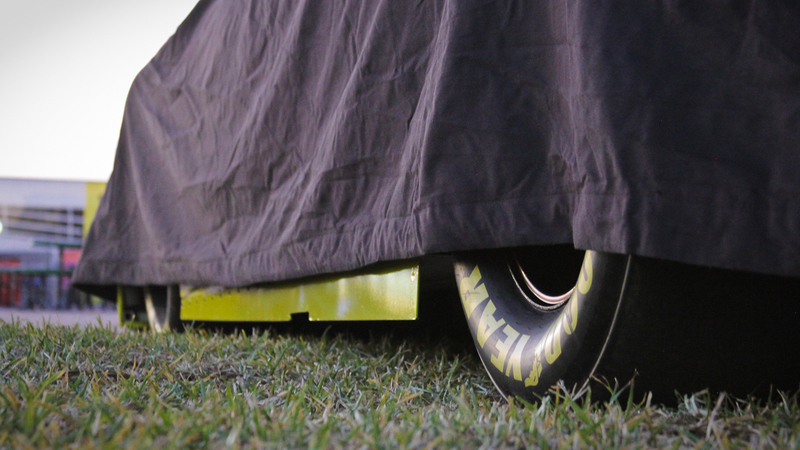 On the NASCAR racing circuit, the Daytona 500 is the biggest event of the season. With well over 100,000 fans cheering their drivers on, it’s one of the rowdiest parties on Earth. Here are four reasons it may also be the ultimate American experience. Many (if not most) sports associate themselves with alcohol and a rebellious nature, but NASCAR alone owes its very existence to moonshine and out-driving law enforcement. When NASCAR started in 1948, most of the drivers like “Reckless” Roy Hall and “Lightning” Lloyd Seay had learned how to drive fast outrunning IRS agents on southern backroads during prohibition. Race day at Daytona International Speedway reveals that alcohol is just as important to racing now as it was then. Not only are several of the race teams sponsored by beer and whiskey companies, but flags with beer logos flutter off of RVs parked on the infield like medieval banners marking dominions. Hours before the race, coolers and grills are hoisted onto the sheetmetal roofs of those RVs. Fans sit back in lawn chairs cracking cold ones and bantering back and forth until the race starts. If you walk by one of these RV parties wearing the t-shirt of the group’s favorite driver, it’s almost a guarantee that they’ll offer to toss a can down to you. Even if the beer isn’t “your brand” it’s in your best interest to take it. For the first decade, bootleggers were the mainstay of NASCAR drivers. They competed for bragging rights in “stock car” races on Sunday before heading back to “work” running from the law on Monday. This outlaw heritage runs deep in both the stands and on the track where car-to-car contact, or “trading paint”, is just as much a part of winning as a having a fast car. Full-contact racing gets fans out of their seats right from the drop of the green flag. Even at two-hundred miles-per-hour, a faster car will use its front bumper to shove the car ahead of them to go faster. In contrast with Formula 1 race cars, which look more like fighter jets than cars, NASCAR race cars are built to look like the stock sedans your parents might drive. This low-tech approach gives the cars greater impact resistance. It’s a throwback to the rum-running days when cops routinely slammed bootleggers to run them off the road. An aggressive driver can spin a car out in an instant, taking out a dozen other cars. It’s a maneuver seen many times during chases on the LA freeways. Not that running from the police is an American experience, but, you know, it is. 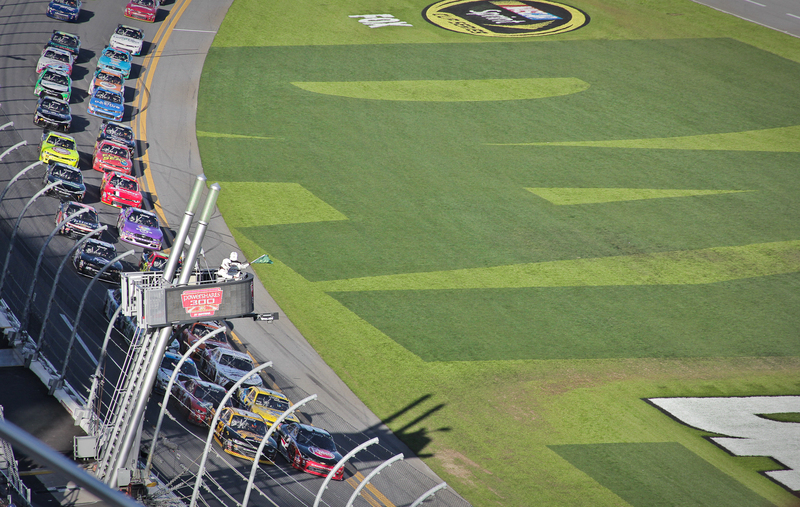 Daytona’s front-stretch grandstand is a mile long. 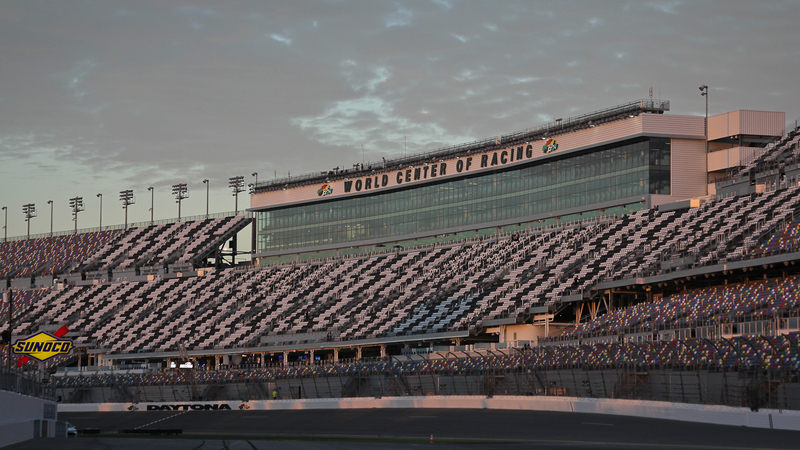 Everything about Daytona International Speedway is big. The grandstand alone is a mile long—so long that the architects had to account for a seven-inch difference in the Earth’s curvature at each end. When you’re at the top of the highest level of seating, it feels like you’re at the top of a class IV scramble in the Cascade Mountains, and the cars roaring along the back-stretch look like tiny dots. There’s a 29-acre lake in the infield stocked with 65,000 fish, as well as space for dozens of RVs. “You can fit fifteen of New York City’s MetLife Stadiums inside the track,” Daytona Speedway’s President Joie Chitwood told me as we walked for a half hour to get from one end to the other. I’ve been a racing fan for years. I’ve gone to local dirt track races and watched NASCAR on TV. Nothing prepared me for the sound of forty-three stock cars screaming down the front stretch. With a great deal of respect to Ferrari and Porsche, brute horsepower is uniquely American. NASCAR is the birthplace of raw horsepower as American car companies followed the marketing philosophy of “what wins on Sunday sells on Monday”. Even California’s early hot rod scene owes its existence to the engine modifications pioneered in a secret room in the back of Louis “Red” Vogt’s Atlanta garage. Earplugs will protect your delicate ear canals, but the roar of 38,000 combined horsepower is more felt than heard. From the drop of the green flag, the V8s rattle you and rumble straight to your core. The vibration will get you out of your seat. And, as the cars howl by on lap one, no one will even notice when you let out a little, tiny rebel yell.